Netflix have shared the first full trailer for season 3 of its acclaimed 1980s-set show Stranger Things. It starts with an amusing telekinetic practical joke and a reunion of friends, but then the pace picks up and the trailer becomes more intense, showing off action, thrills, scares, and monsters. Season 3 takes place in the summer of 1985 so hopefully there will be some good Back to the Future references. Watch the trailer below. Stranger Things became a culture phenomenon and was one of the most talked about new TV shows of 2016. It was Under the Radar's #1 TV show of 2016 and season 2 aired in 2017 and was nominated for several Emmys. 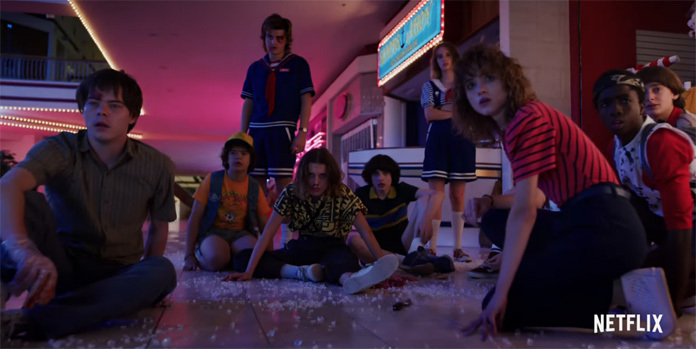 Stranger Things was created by the Duffer Brothers (Matt and Ross Duffer) and stars Winona Ryder, Millie Bobby Brown, David Harbour, Finn Wolfhard, Gaten Matarazzo, Caleb McLaughlin, Natalia Dyer, Charlie Heaton, Noah Schnapp, Joe Keery, Cara Buono, Sadie Sink, Dacre Montgomery, and Matthew Modine. It is inspired by such '80s classics as Poltergeist, E.T., and The Goonies.